and is studying the impact of climate change on the redwood forests of northern California. To raise awareness about the League’s research, she worked with Google Earth Outreach to model old-growth redwoods on Google Earth. In this post, Emily shares her ideas on how technology and citizen science can help scientific research. -Ed. Today is U.S. Arbor Day, a holiday established 120 years ago to celebrate our often under-appreciated forests, which provide us with necessities like clean air and drinking water as well as small pleasures like shade for a summer’s day picnic or a beautiful place to hike with crunchy leaves underfoot. Arbor Day holds special meaning for me because I spend most of my time in the coastal redwood forests of California, working to protect the world’s tallest tree species. In order to protect redwoods in Jedediah Smith and elsewhere, my colleagues and I are working to collect data on geographic regions where the trees are currently thriving to determine how future forests will fare in our changing climate. A critical piece of our work is collecting and comparing field observations of redwoods across different climates, but we need more data to draw strong conclusions—and that’s where you come in. 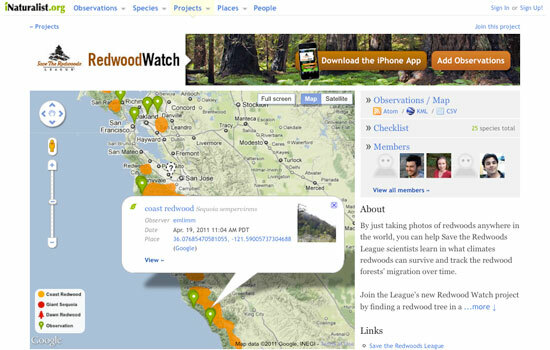 Today, Save the Redwoods League is launching our citizen science project Redwood Watch, powered by iNaturalist.org, a platform for recording, organizing and mapping nature observations. By sharing a simple digital photograph of a redwood tree and the time and location where the picture was taken, you can help the League track and monitor the species. If you know of a redwood tree—perhaps in your own backyard or in a nearby park—you can use the free Redwood Watch iPhone application or your own camera to take a photo, add a comment and submit it online. iNaturalist stores your observation and, if geographical coordinates weren’t captured automatically, uses the Google Maps APIs to assign them to your photo. With your geolocated observation, we can zoom out and analyze your observation in the context of global environmental and climatic patterns. An observation of a coast redwood submitted to the Redwood Watch on iNaturalist.org. The more field observations Save the Redwoods League collects, the better we’ll understand what climate makes a healthy redwood today, and predict where the redwood forests of tomorrow will thrive. We hope to see you on the Redwood Watch. Happy Arbor Day from Save the Redwoods League and Google Earth! Note: There are plenty of parallel projects going on around the world, so if you don’t live near redwoods, consider participating in one of the other iNaturalist.org citizen science projects. From time to time we invite guests to post about topics of interest and we’re pleased to have Emily Limm join us for U.S. Arbor Day. Emily is the science director for the non-profit Save the Redwoods League and is studying the impact of climate change on the redwood forests of northern California. To raise awareness about the League’s research, she worked with Google Earth Outreach to model old-growth redwoods on Google Earth. In this post, Emily shares her ideas on how technology and citizen science can help scientific research. -Ed.